The show that garnered the most nominations this year--Game of Thrones (HBO) with 22--has gotten off to a fast start, leading the way with seven Emmy wins on the first night (Saturday, 9/8) of this weekend’s Creative Arts Emmy Awards held at the Microsoft Theater in downtown L.A. Game of Thrones took the Outstanding Special Visual Effects, Fantasy/Sci-Fi Costumes and Sound Mixing categories for the “Beyond The Wall” episode, Outstanding Music Composition (Original Dramatic Score) and Prosthetic Makeup for “The Dragon And The Wolf” installment, Outstanding Production Design for the “Dragonstone” episode, and Outstanding Stunt Coordination for the overall series. Next up with four Emmy wins was The Assassination of Gianni Versace: American Crime Story (FX Networks) for its Hairstyling, Makeup, Contemporary Costumes and Casting For A Limited Series. Scoring three wins apiece were: Atlanta (FX Networks), The Crown (Netflix), The Handmaid’s Tale (Hulu), The Marvelous Mrs. Maisel (Amazon), the "USS Callister" installment of Black Mirror (Netflix), which earned Outstanding TV Movie distinction, and Westworld (HBO). And winning two Emmys each were: Genius: Picasso (National Geographic), GLOW (Netflix), Will & Grace (NBC) and James Corden’s Next James Corden (CBS On Snapchat). The latter won for Outstanding Short For Comedy or Drama Series, and Outstanding Actor In A Short Form Comedy Or Drama Series, leading Corden in his acceptance remarks to quip about how he yearned to portray himself, to put himself in his shoes. He also thanked his wife who put up with him bringing his character home night after night. 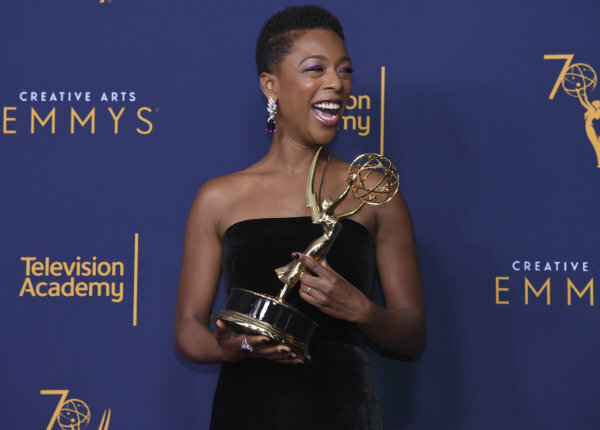 In an Emmy first, all four guest actor categories were won by African-American performers: Tiffany Hadish for hosting Saturday Night Live (NBC); Ron Cephas Jones in This Is Us (NBC); Samira Wiley for The Handmaid’s Tale (Hulu); and Katt Williams for Atlanta (FX). The Cinematography categories on day one of the Creative Arts Emmys went to: Adriano Goldman, ASC, ABC, for the “Beryl” episode of The Crown (Outstanding Cinematography For A Single-Camera One-Hour Series); Mathias Herndl for “Chapter One” of Genius: Picasso (Limited Series or Movie); Christian Sprenger for the “Teddy Perkins” episode of Atlanta; and Gary Baum, ASC for the “A Gay Olde Christmas” episode of Will & Grace (NBC). Backstage, shortly after winning his second career Emmy (the first coming in 2015 for an episode of Mike & Molly, Baum said the biggest challenge of “A Gay Olde Christmas” was it being a period piece depicting Xmas season in the year 1911. He affirmed that everyone came together on the show to accurately capture that timeframe. The first night Creative Arts Emmy tally had HBO ahead of the pack with 13 wins, followed by Netflix with 10 and FX Networks with seven. Another first night highlight was the 2018 Governors Award being presented to the visionary sci-fi TV franchise Star Trek for its legacy of boldly propelling science, society and culture where no one has gone before. Chosen by the TV Academy Board of Governors, the honor was accepted by the stars of the first and most recent series in the franchise, William Shatner (1966’s Star Trek) and Sonequa Martin-Green (2018’s Star Trek: Discovery) and an “out of this world” assembly of more than 80 Starfleet crew members and aliens from all Star Trek franchises, including Walter Koenig, Jeri Ryan, Levar Burton, Linda Park, Terry Farrell and Alex Kurtzman. And the primetime commercial Emmy Award went to Procter & Gamble's "The Talk" directed by Malik Vitthal of The Corner Shop for BBDO New York.